For a more detailed look at the breakdown of revenue from the various sales channels we decided to dive more deeply into where my book money comes from. We had 8 active books in 2014 that brought in over 6 figures across more than 11 sales channels. 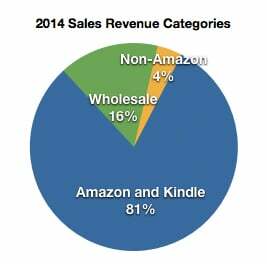 Of my total sales revenue for 2014, Amazon accounted for about 83% of them. Wholesaling and direct sales were about 16% and other platforms including iTunes, Nook, and Smashwords were 4%. There is always some fluctuation between paperback and Kindle on Amazon, but in general my books made about 25% to 35% as much from Kindle books as paperbacks. Wholesale purchases have generally been increasing year to year as I add more books and expand my wholesale network, but this will be more dependent on how hard you try to wholesale your books. 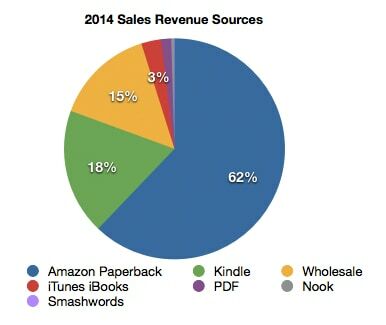 The drop off between the two Amazon platforms and the iTunes and Nook is pretty shocking. Once you have a Kindle version it is very easy to release it on iTunes and the Nook, otherwise we might skip those formats all together. PDF versions of the book are low for us but we try to focus on driving people to the Amazon sales pages instead of selling PDFs from our site. This has the added benefit of making affiliate commissions off of the sale of the book and anything else they purchase. Note regarding the small amount of Smashwords sales: Since it is much more profitable for us to work directly with Amazon, iTunes, and Nook we have opted out of those for our Smashwords distribution. If you were to allow Smashwords to distribute to these three channels you could expect a significant increase in the amount sold through that channel.